As if it wasn't obvious enough already that the smartphone had arrived, new numbers released on Friday confirmed what we already suspected - everyone is switching to smartphones. According to the latest analytics from Strategy Analytics, not only were there a whole lot of smartphones shipped during 2012, but last year was also a record setting 12 months for the increasingly popular devices. Some 700 million smartphones were shipped out in 2012, which was a 43 percent increase over 2011's numbers. To make matters even more impressive, those numbers were possible with the European and North American growth slowing to just 43 percent from 2011's 64 percent. Quarter after quarter, Samsung consistently showed it was the manufacturer to beat, which is why it shouldn't come as a surprise to learn Samsung shipped a record 213 million smartphones in 2012. Just so we're all clear on how impressive Samsung's new record was, the previous record holder (Nokia) manged just less than half of that with 100 million units shipped in 2010. 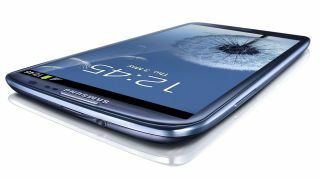 The Galaxy S3 alone sold as many units this year as Nokia had shipped all of 2010. That insanely large number allowed Sammy to capture 30 percent of the overall market, and gave the manufacturer a nice lead on both second-place Apple (19 percent) and third place Nokia (5 percent). Despite Samsung's ridiculous year, both Apple and Nokia more than did their fair share of shipments during 2012. Thanks in large part to the success of the iPhone 5, Apple was able to increase its shipments by 46 percent, which equated to 135.8 million units. Even though Nokia may have fallen of the pace a bit during 2012, its 35 million smartphones shipped was still good enough to capture a place on the pedestal. Unfortunately, what Samsung gained in market share, Nokia lost, as the company's 15.8 percent stake in 2011 dropped to just 5 percent. Even with the Lumia 920 and its other Windows Phone 8 devices, Nokia just could muster enough traction to hang with the leader of the pack. Every other manufacturer combined tallied just 316.3 million units shipped (a 45.2 percent share), which the top three easily surpassed. 2013 should prove to be an interesting year for smartphones, as many of those 2010 contracts will have expired, meaning consumers will be looking to devices like the Galaxy S4, iPhone 5S, and Sony's Xperia Z to replace aging phones. Whether or not such an incredible amount of smartphones will be shipped again remains to be seen.